We celebrated on Christmas Day with our family in Dufur at Dan and Nancy's house. Nancy was a wonderful hostess and made sure everyone was comfortable and happy. I love taking pictures of the kiddos but I'm sure they were ready for me to go home and take my flashing camera with me! This picture is of Maria and Emilio. Hali, Piper, Maria, Kris, and Emilio came up from New Mexico to celebrate Christmas with us. It was wonderful to see them and see how big Piper and Emilio have grown in the past year. Don't ya just love this picture?? Ruby sure loves her grandma! Dixie Lou and her grandbaby...such a sweet picture of the two of them! We even had a visit from a super hero...Sonny aka "Robin". I heard that he may have even transformed into Buzz Lightyear at one point during the night as well. The big boys by the bonfire. Karl has an injured eye and looks pretty cool with his pirate patch! Cutie Kyle and his rock star guitar. He is the sweetest little boy (in my opinion...Alex. ha-ha)! You should have seen how much work it was to get all of these kids in the same place at the same time. I think I took about 20 pictures and this one was the closest I had to all of them looking in the same direction. Aren't they wonderful...a whole new crop of Wilsons! Merry Christmas from all of us to all of you!! How fun! 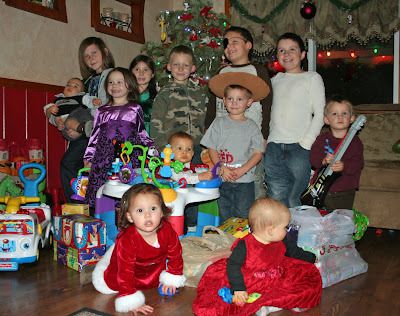 And I thought we had major chaos with 7 kids under 7! haha! I bet they had a blast!